If you’re looking for one answer to ‘what eats shrimp’ then the response is me. I, among many other humans, consume shrimp – semi-regularly for most people. Shrimp catching has become common for recreational and commercial purposes (though mainly commercial). With over 2,000 different species of shrimp they’re a meal to many; some shrimp are very small and others are quite noticeable. Regardless of the species, or size, all shrimp have their predators and after some research, we’ve summarized the information for you below. Fish and aquatic animals make up for the majority of shrimp predators. 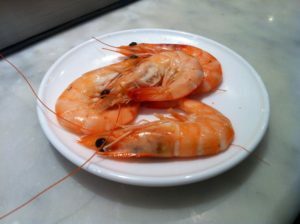 Shrimp usually get eaten by small or medium sized fish, which are still larger. There are also some large fish that consume these shrimp. The Basking and the Whole Shark, very large marine-life, take huge gulps of shrimp through their travels, trips, and journeys. Atlantic and Pacific cods are known to consume shrimp. Them along with American Herring all enjoy a tasty shrimp cocktail, sometimes on a daily basis. More predators still haven’t been mentioned, these include (but aren’t limited to): Squid, octopi, and cuttlefish. More vultures lie within the depths of the ocean floor, leaving no place safe. Hornbacks, stingrays, pipefish, and croakers prey near the bottom depths patiently, and hungrily, waiting. The pipefish attempts to use the element of surprise against the shrimp by blending into the surroundings and ambushing them as they pass by. That’s not all though, different types of birds also prey on shrimp. Flamingos are one of these different types of birds. Their bill, or mouth, is naturally designed to scoop them up. Flamingos are said to get their pinkish feather color because of a chemical in the shrimp. Luckily for most of the food web, excluding themselves, shrimps are tasty and in abundance (and hopefully wont turn our hair pink!). Shrimp are considered scavengers and eat just about anything they can. They are omnivores so they’re not picky at all either. However, different species of fish will eat different things. For example, smaller shrimp are content with eating algae but larger shrimp need better sources of protein. Smaller fish also eat collard greens or kale; bigger shrimp actually may sometimes eat other shrimp and bloodworms. That’s not all though, because shrimps are scavengers they also tend to eat dead animal matter. Plankton and other plant matter is another big part of a shrimps diet and that’s essentially all they will all eat even though they aren’t limited to what was just mentioned.